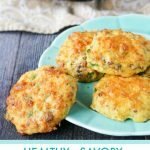 Healthy Savory Breakfast Cookies - freezable low carb breakfast! 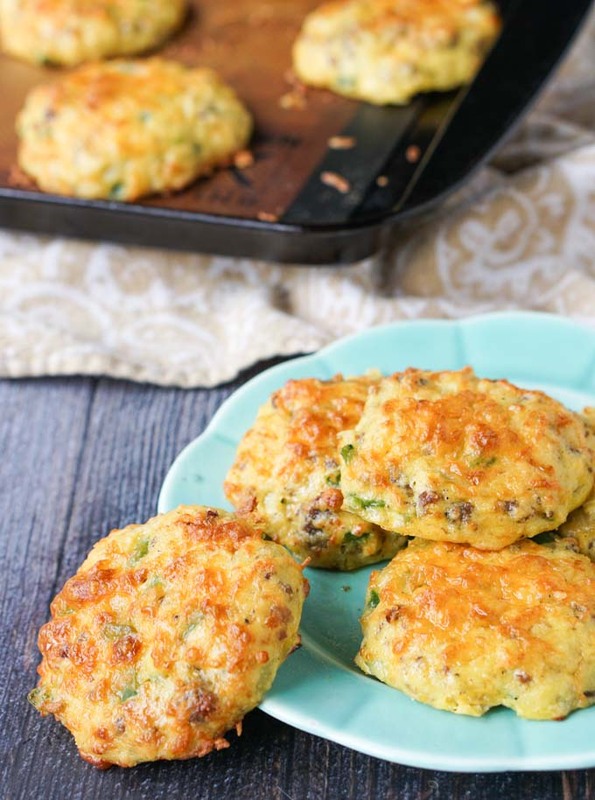 These healthy savory breakfast cookies are like an omelet and biscuit rolled into one. Full of tasty savory ingredients for a low carb breakfast on the go. Each cookie has only 2.9g net carbs. You might also like this low carb breakfast pizza recipe! Ok I’m calling these cookies but they are really more of a biscuit. Cookies sound more fun though. 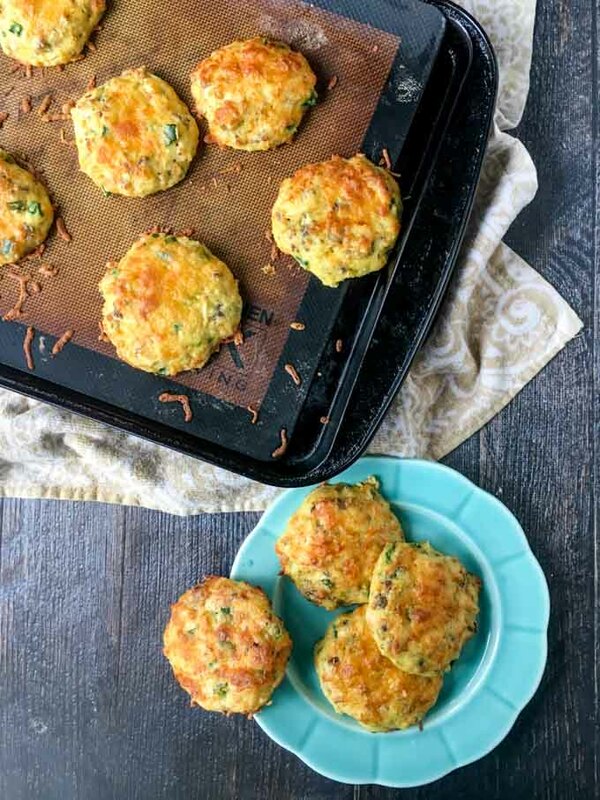 🙂 I wanted something different that I could freeze and then microwave when I wanted a quick breakfast or lunch on the go so I made these savory breakfast cookies. 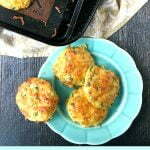 They are low carb and grain free and they are delicious. I used the ingredients that I often use in my omelets: sausage, onions, peppers and cheese. 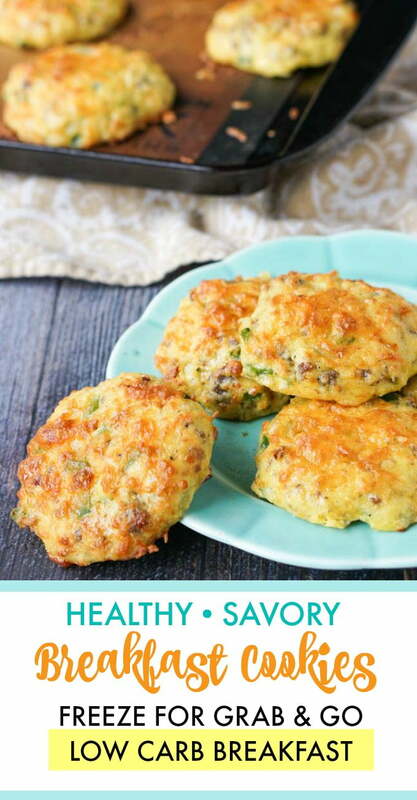 Add a little almond flour and eggs and voila, healthy savory breakfast cookies. I’ve made other freezable low carb breakfast foods like my Freezable Breakfast Burritos and these Low Carb Breakfast Sandwiches so you can see I like a freezable, easy breakfast on the go kind of thing. I always seem to be in a rush for breakfast and sometimes I just plain old skip it. In those cases I’m often eating these things for lunch instead of breakfast. But I’m trying to eat breakfast, I really am. 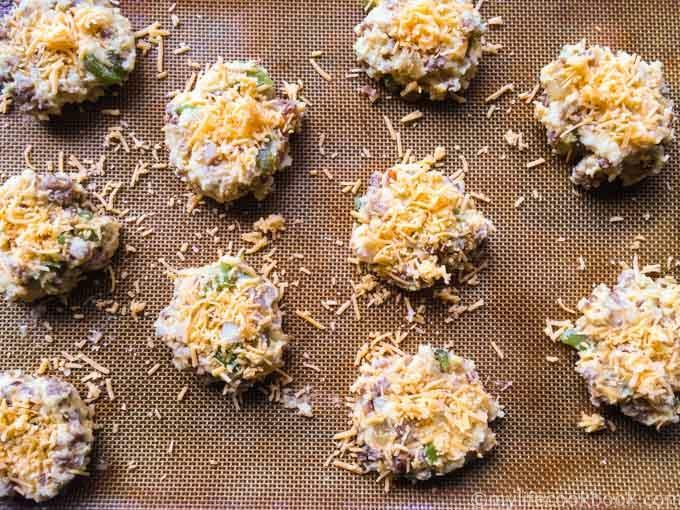 These savory cookies are really easy to make so you might want to even double the batch and freeze them. Here’s how to make them. Sauté onions, peppers and sausage to precook them. Let that cool then add it to some beaten eggs, almond flour and cheese. Mix and form little cookies and then place on a silicone covered cookie sheet. Bake at 375 degrees F for about 8-10 minutes. I have a lot of low carb almond flour recipes on this blog. The almond flour I really like is Honeyville because they use blanched almonds to make a finer flour. But I’ve also used Blue Diamond too. Both can be found on Amazon and sometimes Costco. If you’d like to see my Amazon favorites, check out my page! This recipe made a batch of 12 sizable cookies. I would eat two for breakfast personally. There are only 2.9g of carbs per cookie and 8.2g protein so to me that’s a decent breakfast. Well I hope you like these healthy breakfast cookies as much as I do. If you are on a low carb diet, sometimes variety is helpful. Even if you aren’t low carbing it, I think you and your family will like these because they are quite tasty. And for those doing Weight Watchers, each cookie is 4 Smart Points. Enjoy! PLEASE SCROLL DOWN FOR FREQUENTLY ASKED QUESTIONS ABOUT THIS RECIPE! 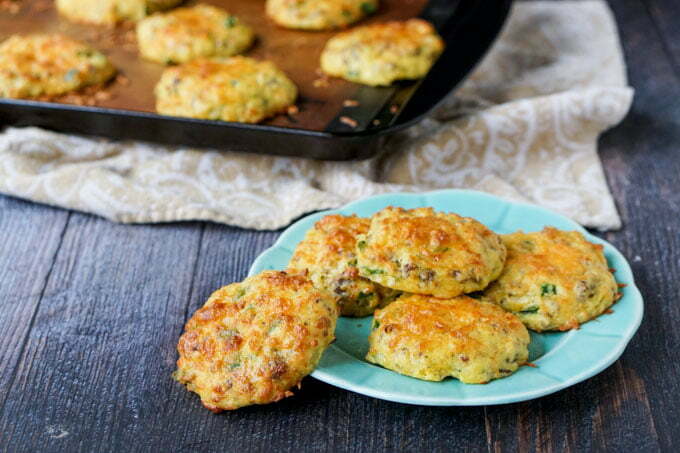 These healthy saavory breakfast cookies are like an omelet and biscuit rolled into one. Full of tasty savory ingredients for a low carb breakfast on the go. Only 2.9g net carbs per cookie. Saute sausage, onions and peppers until the sausage is browned and the vegetable soft. Take off heat and let cool. In the meantime add almond flour, salt, pepper and baking powder to a bowl and mix. In a separate bowl beat eggs, then add 1/2 cup of the cheese. Add to the flour mixture and mix well. Add cooled sausage mixture and mix to combine. Place a piece of parchment paper or a silicone mat on a large cookie sheet. Place a big spoonful of mixture as you would to make cookies. Dough is sticky so try to use the spoon as well you can. Press down gently on each cookie to flatten a little. Sprinkle with cheese and bake for 8-10 minutes. How many would make a good portion? – I like to eat 2 as they are very filling. Can I swap out the peppers, onions, sausage? – Yes you an use hot peppers, or take out the onions. Add different spices if you like. Some people have tried bacon or just used sausage and cheese. Just remember the carb counts will change. Also make sure you use the same amount of flour, baking powder and eggs. How do you freeze these? – I keep mine in a baggie and try to get all of the air out. You can also keep them in a container. They should last at least 3 months in the freezer. Do freeze them individually? – I don’t but you might have a problem of them sticking together. If you are using a container, lay them out side by side and place a piece of wax paper between layers. If using a baggie, they should be easy enough to break apart. How do you reheat them? – Just pop them in your microwave for 30-60 seconds if frozen. You could also just thaw them at room temperature. They can be eat hot or at room temperature. The batter is too runny. Did I do something wrong? – It might be the size of your eggs. Just add a bit more flour until your get the consistency of a cookie batter. Can I make these into muffins? – One ready sprayed a muffin tin and baked for 13 – 15 minutes. Try them and make sure they are cooked through but let them set before eating. I get a different carb count that you. – I suggest everyone enter in their own nutritional information for carb counts. I use the LoseIt app for all of my recipes. Different calculators can get different results because it all depends on different brands of ingredients. Also most calculators have user inputs to their database which can be inaccurate. That is why I think everyone should use their own calculations. Can I substitute flours? – All flours act differently. Coconut flour need much more liquid and you use less of it than almond flour. If you are using other flours than almond flour, just make sure the amount is the same you would use for regular flour. That is almond flour in this recipe is the same amount you would use for regular wheat flour. I’m vegetarian, can I use soy sausage or cheese? – Yes they are easy substitutions. Can I make the mixture the night before and bake them fresh in the morning? – Yes, just make sure to mix them well and they should be fine. Do I use raw or sautéed sausage? – I sautéed the sausage with the onions and peppers first. However you can also use it raw. The peppers and onions should not be used raw and they might be crunchy after baking. If you chop them up very finely they may be ok.
Are these good for diabetics? – Yes they are low carb and the sugar counts are fairly low. Some of my readers are diabetics who make them. What can I use for a dairy free option? – Some readers have used nutritional yeast instead of the cheese. I have not tried this so I’m not sure how much to use. I follow THM diet. Are these these an S? – I’m sorry I do not know the rules of this diet. One reader says that they are are an S. She said that two of them made with the THM flour, egg beaters and turkey sausage would still be a fuel pull. I’m just passing this information on from a reader so I can’t say if it is accurate or not. Please check the comments for her information. What are the consistency of the final “cookie”? – I would say they are like a biscuit. They are soft and airy and not crunchy like some cookies. When you cook the sausage is it sliced or do you take it out of the casing? – I use raw sausage from a roll, like Jimmy Dean’s. I don’t use the links. If you want to use the links you can take the casings off or not. It will still work out fine but it will be a bit different. I must have done something terribly wrong then. I’m sure I followed the recipe. Mine cracked and were crumbly and dry. – The cheese, eggs and sausage should all add enough fat the recipe to make the cookies moist. Make sure you are using the correct amounts of the flour. Check the picture of the “batter” in the post to compare to yours. Will these be OK at room temperature? Thinking of making them in mini muffin cups for bite size appetizers for a pot-luck where I arrive 90 minutes before serving. HI Adrian, I think they will be fine at room temperature. I have never made them into muffins but I’m sure that will work too! Hi Treneka, so glad you liked them! Excellent! I swapped out the green peppers for green chilies and added some oregeno. Hi Bonnie, good idea about the green chiles! I’ll have to try that next time. Thanks for taking the time to comment! Our all time favorite low carb breakfast….freezes well, and reheats in the microwave for those mornings when you need something quick. Hi Sandie, so glad you like them! Thanks for coming back to comment….I appreciate it! These were great! Next time I will be triple the batch and freeze some. I mixed all the cheese into the batter on accident instead of half in and half on top and they worked fine. Thank you for the recipe! So glad they worked out for you Leslie! They are really versatile and you can add different things in them. Thanks for stopping by to comment. I appreciate it! I made these this morning. I purposely used jumbo eggs as I wanted them to be a tad runny. Other than that I used all exact ingredients land measurements listed. I sprayed muffin tins and baked for 13 minutes. They taste just like the Jimmy Dean frittatas. I am excited! I love those but they are very expensive. Thank you! So glad you liked them! They really come in handy when you want a quick breakfast. Thanks for coming back and commenting! By far the BEST breakfast option I have come across in my 5 year journey. I will be making these often. Thank you! Thank you so much! So glad you like them! I think that they are filling so personally I would say 2??? Made these yesterday and they were good but even better today. This is the second recipe from this site that I’ve made and both have been really good but I put the ingredients into my carb manager with exact same ingredients and measurements and again the nutritional value is different from yours. That’s the only thing I’m not happy with. Carb manager has always been very accurate. Hi Donna, it’s frustrating for me too. I use the Lose It app for all my recipes to keep it consistent. I’ve used it for the last 5 years or so. I’ll attach my nutritional analysis screen shot for you. However here are a few reasons for differences that I came across over the years. 1) Different brands have different nutritional values. So one brand of almond flour may have different carb count than another. 2) Some apps have nutritional information entered by their users and they are definitely wrong. I found this to be the case with My Fitness Pal and other online apps. I wish there was a standard food counter from the FDA or something like that. I try to use the UPC scanner on my app when possible so it’s the most accurate but even that doesn’t always work. So I’m sorry that this recipe info is not working out for you. I really think you should use your own calculations if for no other reason than consistency. However I do think that mine is accurate too. Good luck! I’ll go check out Carb manager and see if that is something I can use in the future. 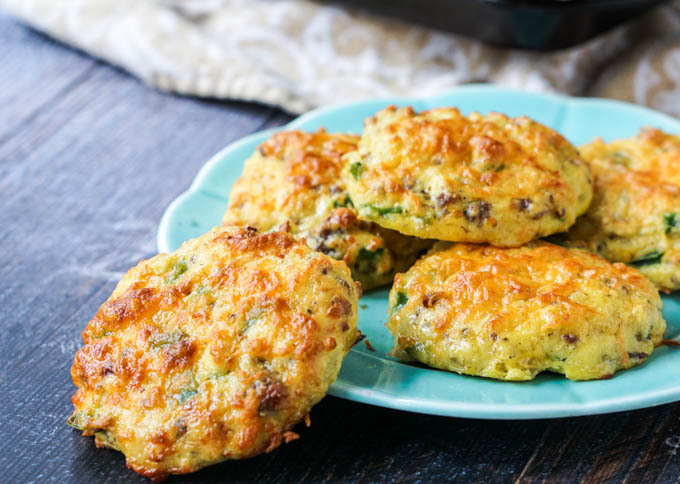 Love these – delicious, easy, convenient! It’s a keeper. I accidentally made with coconut flour instead of almond. How drastically will this change the carb intake? Not as tasty as I would imagine if made correctly. Gonna definitely try again! Hi Holly, the thing about coconut flour is that you need much less because it absorbs alot of liquid. It will definitely taste better with almond flour OR you could use much less coconut flour. I think the ratio is 1 cup of almond flour is equal to 1/4 cup coconut flour. As for the carbs, coconut has more net carbs cup for cup but since you would be using less, it would have less. Hope that helps! P.S. I put the recipe into Carb Manager, and it came to 1.9 net carbs per cookie. This makes a big difference when you’re trying to keep net carbs under 20 for the day! I’m glad that it’s lower in carbs! I use the LoseIt app for my calculations just to be consistent across all my recipes. I’ve found with all the calculators I’ve used that you can get a variety of numbers because some of the entries are calculated by users and they could be wrong or incomplete. Anyway, glad it worked out ok for you! Hi there-I was skeptical about these. I was wrong!! All 3 of my (picky) girls loved them, and so did I. They were easy and fast. I made the sausage ahead and had it ready to go in the fridge. Skipped the peppers (see above re: picky girls:)), switched regular onion for green onions, and mixed in the cheese as suggested. Thanks so much for this recipe—I think it will become a staple in my family. Thanks for taking the time to come back and comment and for your tips. It always helps when readers see what other people do. I’m so glad you all liked them! Hi Cyn, so glad you and your family like them! And thanks for sending in your tips for the vegetarian substitutions. That might help other readers. I am jumping on the Keto bandwagon. I saw this recipe and it looks delish. 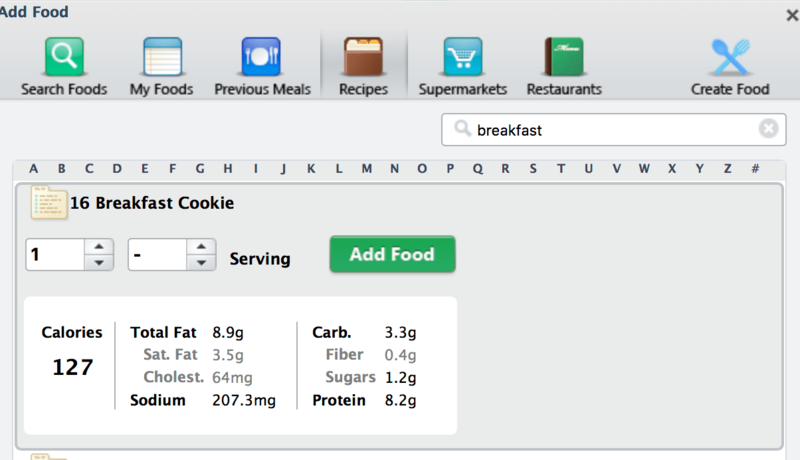 Can you tell me the protein and fat grams in one cookie? If you want to play with the macros for keto, you can probably top it with some butter or maybe add more cheese on top? Hope that helps! I just took these out of the oven. OMG I love them. I will be making a batch for my husband to take on the road with him. He can pop them right in the microwave why he is ready to eat. Thanks for an amazing recipe. Hi Sharon, so glad you like them! It’s a very simple recipe but it works well. If you read some of the comments, other readers mix it up a bit with good results. Thanks for taking the time to comment! What a fabulous recipe! We tried it this morning and the family ate more than they intended! So I made an extra 2 batches to freeze! I used frankfurters instead of raw sausage meat (as didn’t have any to hand) and tweaked a second batch as my daughter is allergic to nuts. We used plain flour, added fresh sweetcorn and broccoli – had to cook for an extra 10-15 mins. Turned out great. Thank you for the recipe! Thanks for taking the time to comment and sharing your ideas. I think this recipes is very forgiving and you can put just about anything you want in them. I’m so glad you liked them! Does anybody know if you can make up the mixture and keep it in the fridge overnight till the morning? And then bake them fresh in the morning? I have never done that but I don’t see why you couldn’t. It’s more of a biscuit texture so I don’t think the dough would be any problems. Hope that helps. I sautéed the sausage, peppers and onions before making the cookie. I hope that helps. Please let me know if you have any questions. 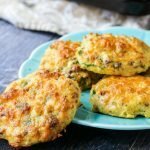 I have been looking for a truly great low carb dish that reminds me of what I can’t have anymore and I loved this! My daughter did too and she doesn’t eat low carb at all! We are going on a camping trip and these are bf each morning instead of Mom cooking. I have cooked and baked since I was 8 and after becoming a diabetic I have disappointed so many times when people put something here and say it is delicious, BUT YOU MY DEAR DID JUST THAT. Thank you and I just may have to follow your board and I have never done that here! BTW, so much better the next day! I have to tell you this comment made my day. I’m so glad you like this recipe. It might take some time but I’m sure you will find recipes that you really like. Have a great weekend and thanks for taking the time to comment. So, so good!!! We just love them. I doubled the recipe and was wondering the best way to freeze them was. I’m so glad you like them! I just put them in a ziplock back or a plastic container and put them in the freezer. cook them in 30 second intervals but it should take long. Hope that helps! I’m so glad you liked them! I’ll have to the jalapeños and hot sausage…we love those! Made today. I omitted the peppers and onions, used a 12 ounce roll of Jimmy Dean reduced fat sausage, and doubled the remaining ingredients. Looked just like the pictures and tasted very good. Super easy, i will defintely make again and share the recipe with friends. Thanks for sharing with us! Thanks Linda! So glad you liked them and thanks for taking the time to comment about how you altered them. That might help other readers. I’m in love! They are delicious and fit in perfectly with my schedule. They tasted so much like a biscuit, I swear I can taste the gravy! Thank you for making this way of eating so easy! Glynis, I’m so happy you like them! It’s not too hard of a way of life. You just have to find some good recipes you like and then find items you can eat out at restaurants and you are covered! Made these this morning and they were a huge hit! I totally misread the sausage and used a whole pound but otherwise made as directed. They were still fantastic. Maybe more omelette like in texture rather than biscuit like. Sprinkled with a little nutritional yeast after baking and served with fresh berries. Yummy! Thanks for a great recipe! Thanks Rebecca! I’m sure the extra sausage was fine as they are pretty fool proof. Glad you liked them!